Many years ago we were involved in showing Arabian show horses. A horse with a superb coat and/or superb endurance was a must. Talking with many trainers, feed store owners and "old timers", I would ask them "what did you feed that horse to get such a nice coat or high energy level?" From the answers I received and years of application, I have applied this knowledge and put together recipes for feeding our brood does, bucks & show rabbits at COTTONWOOD FARMS, as many of the same principals apply in achieving top notch animals whether it be show horses or show rabbits. In our quest to 'get it right' we referred to "Fibber" McGehee's excellent article, "Conditioning Rabbits" on page 129 of the Official Guide Book, Raising Better Rabbits & Cavies. Everyone should read this excellent article. Make NO mistake our conditioning mixes are not "magic" formulas. The breeder/feeder must first genetically produce an animal with the outstanding body and fur with great density and texture. Then, these conditioning mixes are fed to enhance the coat luster and promote healthier rabbits and produce larger litters. They WILL NOT create what the breeder failed to create - superb fur, high shoulders, top line, etc. This brew has ingredients that are high in fat content and should be used for the junior and younger senior show animals to add flesh and improve coat condition. It can also be used for the brood does that have had several litters and you want to add some body flesh. This brew has ingredients that are mainly for higher energy levels and less fat content and should be fed to the bucks and brood does to maintain flesh condition. There are other ingredients that can be used or substituted into the conditioning mixes such as wheat germ oil, linseed oil meal, sunflower seed, and cane molasses. In my opinion, wheat germ oil is too expensive for feeding to multiple numbers of rabbits for the benefits derived. We do use it occasionally though. I sometimes substitute linseed oil meal (linseed meal is a byproduct, processed from flax seed after the oil has been extracted) for the flax seed especially if the feeders have screens in the bottom. Calf Manna can be used instead of the Stock Builder pellets also. The breeder/feeder must also learn which and how much conditioning mix to feed to go along with each rabbit's alfalfa pellets. Each animal has different characteristics which require attention. For example, some rabbits are "easy keepers" as I call them. They are the rabbits that grow seemingly right before your eyes just being fed regular alfalfa based pellets. Feeding them any of the conditioning mixes might be a mistake by giving them too much body flesh. In this case you may feed them a handful of rolled oats for energy and grass hay to keep them trim. Just let them "sniff" the mix. Weather also determines feeding of conditioning mixes. In the heat of summer, we cut back on the ration amount. In the winter, we increase the ration amount. It's up to the breeder/feeder to watch each animal's condition and know when to increase/decrease the conditioning mixes as needed. A secret to feeding conditioning feed is to feed it on a regular basis. It won't be as effective if the daily ration is skipped. One more thing to keep in mind, is that if the rabbit being fed the conditioning brew develops diarrhea, you should stop feeding the brew immediately. First time feeding and young rabbbits should be watched very carefully. Steam-rolled oats are whole oats that have been steamed and then rolled flat or crimped. In this form, the digestability is increased over whole oats. It is used as an energy feed with no added vitamins or minerals. Crude protein is not less than 11.00 % and crude fat is not less than 3.50 %. Steam-rolled barley is whole barley that has been steamed and then rolled flat or crimped. In this form, the digestability is increased over whole barley. It is used as an energy feed with no added vitamins or minerals. Crude protein is not less than 11.00-12.00% and crude fat is not less than 1.50%. 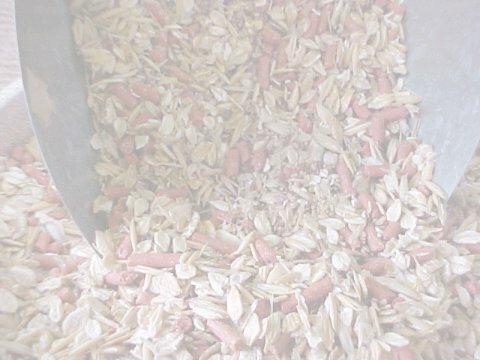 Whole oat groats are oats that have had the hulls removed and have been heat treated to stabilize enzymes which cause rancidity. Crude protein is not less than 12.00% and crude fat is not less than 5.50%. Flax is one of the oldest known cultivated plants. According to some archaeological data, flax was cultivated in Babylon around 5000 BC. Flax has been used since antiquity to maintain healthy animals. In cattle its reported uses included the correction of digestive disturbances in calves, easier calving and reduction of certain infectious diseases such as hoof-and-mouth. Horse owners have reported using it to produce glossy coats and to treat respiratory infections. It has also been added to the diets of pets to improve their appearance and improve their general health. Flax is rich in protein, fat and dietary fiber, each contributing to its overall value in the brew. Flax seed has traditionally been valued for its abundance of fat. Flax is low in saturated fat and high in polyunsaturated fat. Flax seed contains essential vitamins and minerals. It is particularly rich in potassium, providing about seven times as much as banana on a dry weight basis. Flax seed provides minor amounts of magnesium, iron, copper and zinc. The fat soluble vitamin, tocopherol or vitamin E, is present in flax seed also. Flax seed is used for improved overall health, improved appearance, improved immune system, improved energy and relief from inflammatory and arthritic conditions. STABILIZED RICE BRAN - They call it bran . . . . but think of it as fat. Rice kernels are covered with a thin skin and encased in a fibrous, inedible hull, much like almonds have an inedible shell and a skin enclosing the nut. In processing, the rice hulls are milled off and the thin skin scraped away in tiny flakes. These tiny, yellowish flakes have a very high fat content. They can be marketed as raw or processed rice bran. Left unprocessed, raw rice bran falls below human/animal food grade standards for rancidity within about 8 hours. When the raw rice bran is processed into feeds, preservatives added at that point stabilize whatever nutrients remain. Stabilized rice bran is preserved by pressing it through dies. This extrusion process stabilizes the bran and gives it a shelf like of approximately a year. Fur and skin all benefit from the added fat and vitamin E in rice bran. Crude protein is not less than 12.50% and crude fat is not less than 14.00-23.00%. Conditioner, vitamin and mineral supplement pellet that promotes a healthy coat and skin condition. It provides nutrients necessary for a healthy appetite and efficient feed utilization. It also promotes muscle development. The basic ingredients of these pellets are soybean meal, wheat bran, ground corn, ground barley, whole dried whey, wheat flour, brewers yeast, sun cured alfalfa meal, calcium carbonate, linseed meal, salt, hydrolyzed vegetable oil, cane molasses and almost every known mineral and vitamin known to man. Crude protein is not less than 25.00% and crude fat is not less than 3.00%. Dried brewers yeast is used for muscle development, excellent skin condition, hair growth and coat quality. Yeast also assists in improved digestive efficiency. It's nutrients feed and nourish the digestive organisms that do the work of converting feed to nutrician for the animal. Canola is Canada's major oilseed crop. It is grown for food consumption around the world in such far reaching places as Asia, India, Australia, Europe ad the U.S. It is the cheapest cooking oil on the market today. It is used to fry potatoes in fast food restaurants. Canola oil contains the lowest amount of total saturated fat of commonly consumed vegetable oils and is second only to olive oil in the levels of the important monounsaturated fat, foleic acid. Canola oil is also a rich source of vitamin E. The shelf life of canola oil when stored at room temperature is roughly one year. Canola oil provides a convenient, palatable, concentrated energy source for the rabbits diets. It helps to promote good skin and coat condition. The domestic rabbit descended from the Europeanwild rabbit and was introduced in England in the 12th century. Many different varieties and sizes of rabbit have been developed since then. Today, the American Rabbit Breeder's Association recognizes 38 different breeds ranging from the tiny Netherland Dwarf to the Flemish Giant. The National Research Council of 1977 estimated that approxiately 6 to 8 million rabbits consume feed in the U.S. annually. Compared to other livestock species, little is known about the nutritional requirements of rabbits. This report is intended to provide an update on the latest developments in rabbit nutrition. Knowing that Bluebonnet rabbit feeds have been developed using the most current research, we can provide sound advice to the rabbit producer in reommending Bluebonnet feeds. NUTRITIONAL REQUIREMENTS The chart below contains important knowledge about the basic nutritional requirements of rabbits. Crude Protein Crude Fat Crude Fiber Maintenance 13% 2% 16% Gestation 16% 2% 14% Growth 16% 2% 14% Lactation 18% 2% 12% These requirements are minimum and are aimed at the commercial breeds of rabbits, such as the New Zealand and Californian. These are medium breeds, and may require slightly more concentrated rations than the large breeds and less concentrated rations than the smaller breeds. The non-pregnant adult doe and the adult buck have the lowest nutrient requirements. Bluebonnet Rabbit Booster 16 is ideal for these animals and can be fed to avoid over fattening. Although the crude protein requirement is only 13% for the maintenance rabbit, this 16% ration was developed so that rabbits in poor condition can regnerate any lost tissues. This will increase longevity and reduce the culling rate. During gestation the doe requires only slightly more nutrients than the non-pregnant animal. Requirements during the latter third of pregnancy increase to provide for the exponential growth of the fetus. Most producers limit feed their gestating does. Kindle Bits 18 provides extra protein for the developing fetus. Many producers will increase feed during the last week of gestation, but it requires some experience to feed enough to meet the nutrional requirements and avoid over fattening. Research has shown that fat does have more problems during kindling than non fat does. However, if they are underfed during gestation, the chances of abortion increase. A good rule of thumb is to provide the amound of feed that is cleaned up daily. This will inrease late in gestation and will also be greater during the cooler months. The best results will be achieved with the daily supplementation of Boost Em beginning one week prior to kindling. Research has shown that the greater the protein during gestation, the larger the litter size. The average doe has only 8 teats. With the amount of variation in the genetic pool, litters as large as 17 and as small as 1 are being produced. Fostering the kits between does is good management practice. This can be done with litters at varying ages, but is best when the two litters are only a few days apart. The preweaning fryer requires less percentage of protein in the diet, but the increased intake result in an increase in the total amount of protein consumed. As with any animal, the period following weaning is a critical one. If the animals are severely stessed at this point, poor performance results. Growing fryers are most susceptable to the enteritis diseases that claim up to 20% of all rabbits in the U.S. The fiber level of the diet is an important factor in formulating rations for these rabbits. Too little fiber and high amounts of readily degestible carbohydrates cause a proliferation of toxin producing bacteria in the cecum. These toxins result in acute diarrhea and rapid death. There is no known cure or vaccine for this condition, but with the proper level of fiber in the diet, the amount of available carbohydrate reaching the cecum is redued, and enteritis is prevented. However, too much fiber (especially finely ground fiber) can result in a blockage of the cecum, this can also result in death. Bluebonnents rabbit feed are formulated to decrese the chances of these problems. They contain the necessary levels of fiber to prevent enteritis, but do not contain excessive amount that would lead to cecal impact. LACTATION After kindling, the nutrient requirements increase dramatically. All nutrients, especially protein and energy, are needed in great quantities to provide nutrients in the milk. Fortunately, the lactating doe can increase her feed intake to compensate, but depending on the size of the litter, these animals may be in need of additional energy and protein. Rather than decreasing milk production, the doe's body tissue will be sacrificed and therefore, it is recommended, to full feed a high quality rabbit feed such as Kindle Bits 18. Supplementing with Boost Em also assists the doe in producing milk in abundance. Milk production is highly correlated with litter size. Therefore, the does with larger litters should receive slightly more Boost Em than others. Fostering to even out the litter size among does enable the rabbit producer to feed similar amounts to all does. Preweaning Growth The preweaning rabbit is totally dependant on the doe for the necessary nutrients needed until approximately 21 days of age, when milk production drops and the young kits leave the next box in search of solid food. Kindle Bits 18 contains the necessary quantity of high quality protein, vitamins and minerals that the growing rabbit needs. Providing a creap feeder filled with Kindle Bits 18 ensures a good transition from the doe's milk to a solid feed. This also reduces stress on the lactating doe, enabling her to reduce milk output and lower the chance of mastitis.